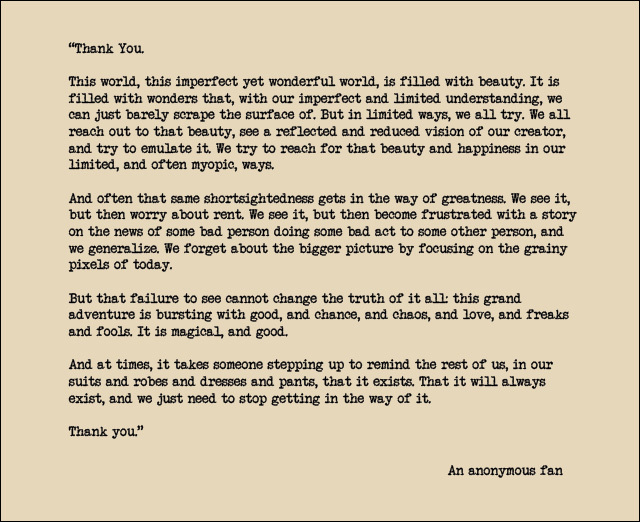 A few weeks ago I received a love letter. Not the paramour kind but one with moving affection for my alter-ego. 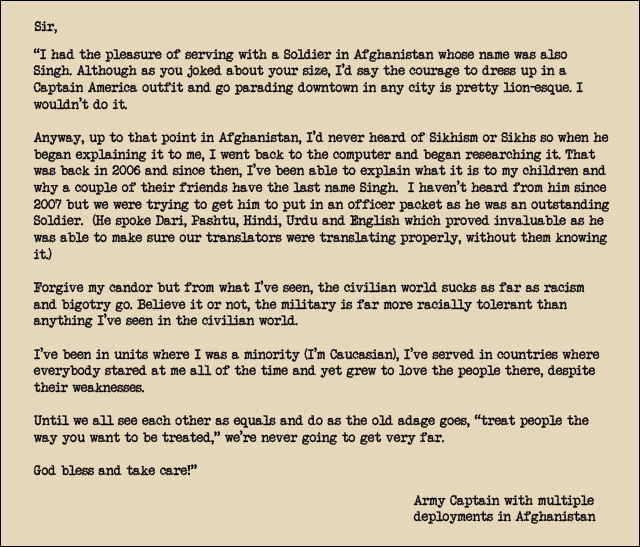 An Afghan war veteran had just discovered my pics from the Captain America in a Turban photoshoot on the streets of New York City. 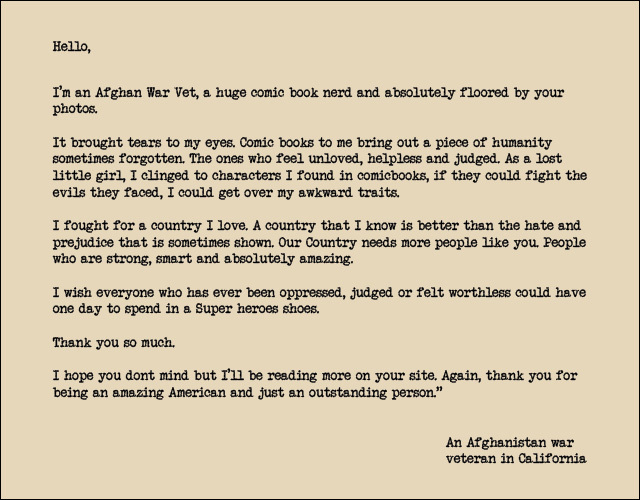 She felt compelled to share her response. I have been receiving similar letters for months since the pictures went public last September. 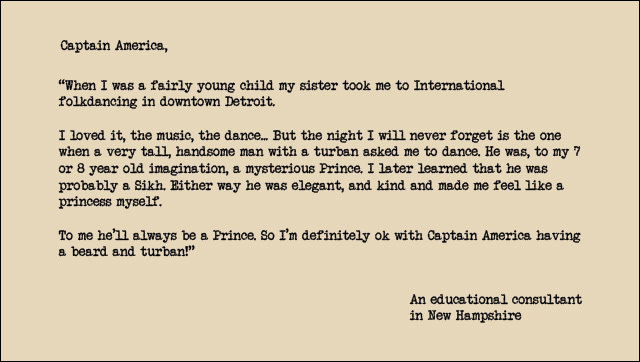 The overwhelming warm reception has been life affirming for me in turn inspiring What I learned as Captain America in a Turban. Turbans continue to elicit intense visceral reaction in the American narrative. For many it is still synonymous with the 'other.' I got a rude reminder of this a few days ago as I was about to turn a street corner getting home in New York City. As I passed a group of high schoolers a voice trailed me, 'Osama.' I turned and asked the young boy, "You think I am Osama?" He denied saying it. I said, at least have the courage to say it on my face. I told them here you are stereotyping me based on my looks. How about if someone responded to their looks with, "Illegals! Go back to your country." He responded with an apology which I accepted. But not before educating them about where I come from and there being much more to life than meets the eye. He apologized again. I returned home a little annoyed reminding myself why I had walked out as Captain America on the streets of New York City last summer and even more energized for my artistic endeavors. 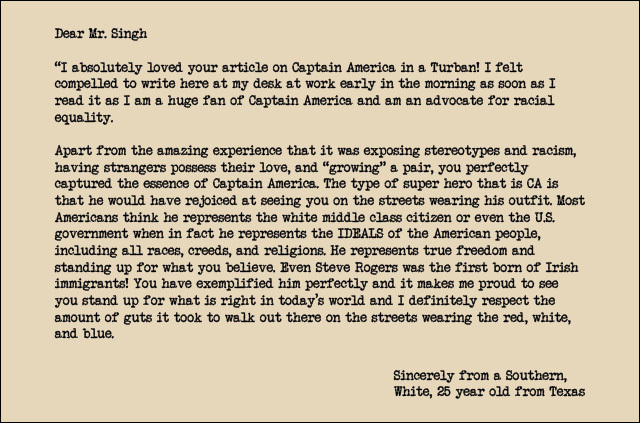 In the spirit of Robert Louis Stevenson's words, "Keep your fears to yourself, but share your courage with others," I present to you a sampling of love letters to a Turbaned Captain America from fellow Americans. 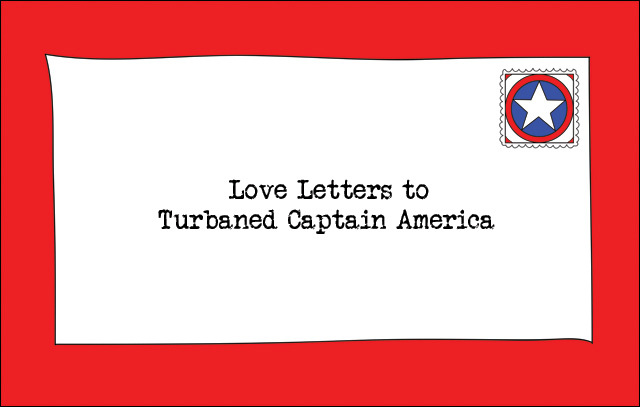 Visit Sikhtoons.com to learn about my Captain America journey, turbaned cartoon art, superhero cartoon workshops and much more. Vishavjit Singh is the nation's first and only turbaned/bearded editorial cartoonist. He got his spark for cartooning following the upheaval filled days after 9/11. He brings turbanful characters to life on the 2-D pages of his computer aided by his right indexed finger on a touchpad. His works can be consumed at Sikhtoons.com.